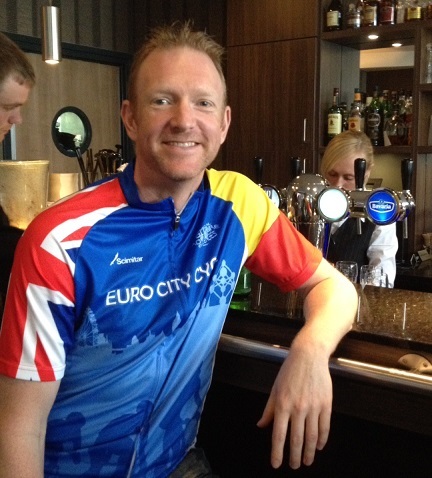 For the final day of the Euro City Cycle, it felt appropriate to sport the team colours of the tour. So far it’s been a blast… and it’s not over yet! This entry was posted in Charity Bike Ride and tagged Cycling, Euro City Cycle on May 10, 2014 by Paul Squire. you’re looking good………trusting everyone else is……..the end is in sight and that you will all cross the finishing line in style! Bet you can almost taste that ice cold beer! It’s behind you (photo). Will be the most well deserved drink in the history of drinks that are very well deserved! Fingers crossed you all make it over the finishing line today.